Recently on Facebook a new type of scam has become common. It's the Share To Watch Video posts that appears on your time line. When you click on the video image in the post, then an intermediate window will appear, which forces the user to share the video / post before watching it. When users share, then it will be asking the user to fill some sort of questionnaires or participate in surveys or even shows some faked videos. Some posts may lead to some spam sites which asks you to download and install some softwares. This may affect you computer as well. 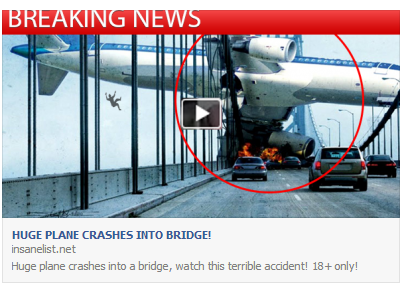 A "breaking news" message that features an image depicting a passenger jet crashed into a traffic bridge includes a link that supposedly opens a video with more on the disaster. It is a video survey scam The image does not depict a real plane crash. It is an artwork. "97 Percent Of Peopel Can’t Watch This Video For More Than 10 Seconds" is another force click spam, which asks users to share the video for watching it. Dont click on it or share it.